If you work hard, you’ll be able to earn a living. People often equate working hard with wealth. If you aren’t rich, you just haven’t worked hard enough. Those in the middle class who insist that tax breaks for the rich will benefit everyone often have high-flown ideas that, since they are awesome and they work hard, they “deserve” to be rich eventually, and they will finally be blessed with worldly wealth — God’s reward to the righteous and hard-working. The unfortunate reality is that hard work doesn’t mean that you’ll end up with more money. Some of the hardest-working people I know are those with two jobs, who can barely make ends meet. You can be productive as you want, but anyone starting out in a certain socio-economic situation is likely to stay there, even with a great deal of hard work. This largely has to do with income inequality in the United States right now. 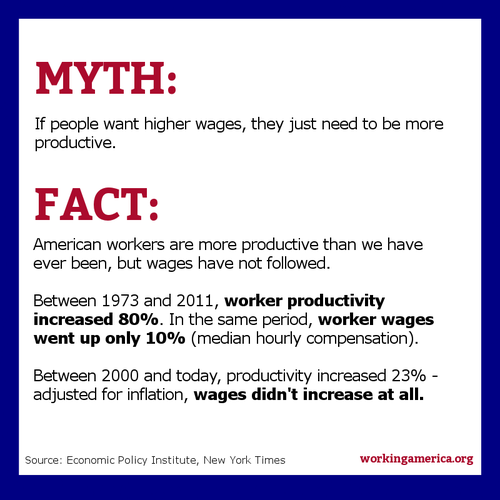 That’s right: Worker productivity has been increasing. People are working harder. And their wages aren’t keeping pace. Study after study shows that since the 1980s there has been growing income inequality. The middle class — the backbone of our economy — has been shrinking for decades now, and wealth is increasingly concentrated in fewer hands. The growing wealth inequality has become even more pronounced since the year 2000. For those at the top, it doesn’t matter if wages stagnate or drop, as long as the economy keeps chugging along, with corporate profits increasing and the stock market doing well. Even before the Great Recession, this income equality was growing. Between 2002 and 2007, 65 percent of the nation’s income growth when to the top 1 percent of households. That’s huge, when you think about it. Continued income inequality isn’t just about the fact that your hard work probably isn’t going to mean more wealth for you. Part of the issue is that opportunity often accompanies wealth. I’m aware that I had opportunities, growing up middle class, that someone growing up poor probably doesn’t even know about. Access to education, ideas, and opportunities all accompany wealth. The wealthier you already are, the better your chances to maintain that wealth or improve it. We like to think that hard work and gumption alone are enough to ensure wealth and upward social mobility. Horatio Alger stories are, after all, ingrained in the American psyche. It could happen to you. This might have been true in the 1950s and early 1960s — a time shaped by high top tax rates, and a thriving middle class in which CEO pay wasn’t more than 300 times worker pay, and a healthy fear (prompted by memories of the decade following the crash of 1929) of letting the financial sector have its way. Unfortunately, all of the things that made that economic watershed possible were systematically undermined in the following decades. The situation is different now. Social mobility has all but disappeared, so no matter how hard you work, chances are that it isn’t going to result in long-term wealth. And as long as you are content with “enough,” that really isn’t a problem. The depressing thing is that you can work very, very hard and still find yourself barely able to get by. The last time the wealth gap reached such proportions the result was a little something called the Great Depression. How do you account for the leaps in in production that technology has wrought within this same exact time-frame? Do the added costs of supplying this technology to the workforce enter into your equation? I find it strange that these two items were left out of your article. It seems, that in your urgency to make the best argument you could for your point of view, you left out some very relevant facts and research. You could include this information and draw the same conclusion, it would just not be quite as provocative.